How do writers turn everyday events into fantastic adventures? I’m happy to share some of the tricks and techniques I use when I visit your school or library. My presentations are fun and interactive, just right to get students motivated as you kick off a writing unit. This assembly-style presentation for upper elementary school and middle school (grades 4-8) is all about writing nonfiction. How do the Weird But True books come together? What is the research like? How do writers make their stories fun to read? And what are some of my favorites facts and stories that made it into the Weird But True books (or didn’t). 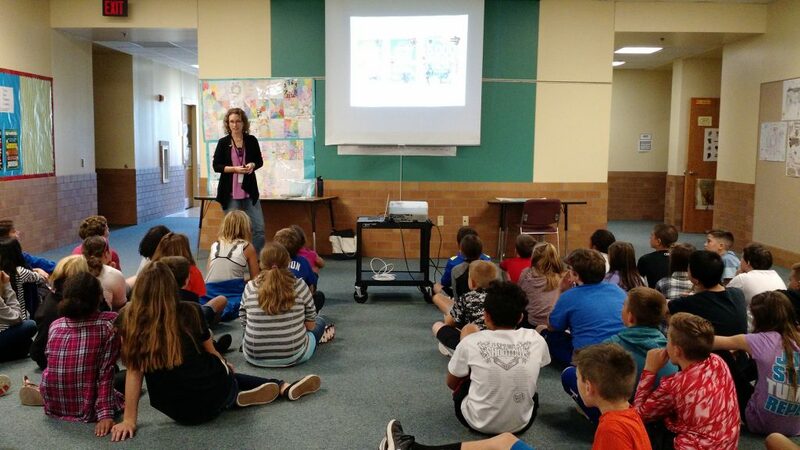 In this workshop for grades 3-5, I talk about what it’s like to write National Geographic Kids’ Weird But True Ripped from the Headline books: how I find topics, how chapters come together, and how I create fun-to-read stories. Students will get to choose from an assortment of ideas and use these to practice writing Weird-But-True-style short stories. In this workshop, we will cover: how to find interesting information and be sure it’s true, hooking your readers, and making your writing fun and snappy. This workshop for grades 3-5 starts off with an assortment of photos of wacky events—the perfect prompts to ignite the imagination. As a group, we will select one image and use it to brainstorm story ideas, then write (and revise) our group story. Students will then choose their own images and practice brainstorming and writing their own stories using the techniques we covered in the first part of the workshop. If none of these programs is quite what you have in mind, I would be happy to discuss a program that would fit the age group and curriculum, whether content-based or with an emphasis on the writing process (fiction or non-fiction). I offer half-day or full-day visits. Half days consist of 2-3 presentations, plus a book signing (please note in your inquiry whether you are interested in selling books). Cost: $350. Full days consist of up to five presentations, plus a book signing. Cost: $600. I charge travel expenses for schools more than 30 miles from Lincoln, Nebraska. For schools more than two hours away, please book two sequential days. Ideally, this will be split between two (or more) schools (this will also allow you to share travel costs). Wondering why it costs so much? Learn more here. Funding is available to cover the costs of bringing in authors. Here are some tips on seeking local support or getting grants for school visits. Please fill out the contact form for information on availability. I look forward to meeting you and your students!